If you ask a Peruvian what happens on June 24, you’ll likely receive one of two answers. If you’re in the highlands or any other region west of the jungle, the answer will probably be Inti Raymi (the Inca “Festival of the Sun,” a major event in Cusco). Ask the same question in the jungle regions of Peru, and your answer will be San Juan. What is the Festival of San Juan? The Fiesta de San Juan, or Festival of Saint John, is a festival in honor of Saint John the Baptist. Celebrations occur in various parts of the world, including Spain and Portugal, on June 23 and 24. In Peru, June 24 is the central feast day, which also ties in to the southern hemisphere's winter solstice (not that you'll see any signs of winter in the jungle). The day is celebrated to varying extents throughout the country, but nowhere are the festivities more pronounced than in the jungle, where the celebrations rival -- and often surpass -- those of Christmas and New Year’s Eve. John the Baptist is the most prominent saint in the Peruvian Amazon. His association with water is particularly relevant in the jungle regions of Peru, where rivers are vital to the economies of many communities. Continue to 2 of 3 below. What Happens During the San Juan Festival? 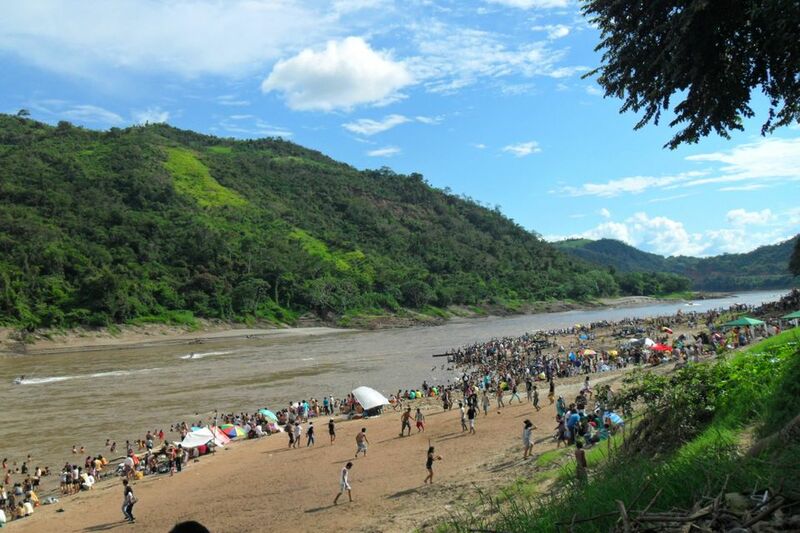 By midday on June 24, Peruvians in towns and cities throughout the jungle have relocated to the riverbanks. They spend the day swimming in the river and relaxing in the shade, while copious amounts of beer and cups of locally produced wine are passed from hand to hand. With plenty of riverbank locations to choose from, you can make your day as relaxing or as active as you like. You can pick a quiet, family-friendly spot with room to swim and relax by the river. Alternatively, you can head to a more organized event with live bands, food stalls and riverside activities such as boat rides (jet skis may also make an appearance). Mototaxis normally buzz around from one location to the next, so you don’t have to stay in the same place all day. If you decide to spend San Juan along a quiet stretch of river, you won’t necessarily find anyone selling food or alcohol, so pack accordingly. In the days leading up to San Juan, female family members prepare juanes, bundles of seasoned rice wrapped in green bijao leaves. Juanes are named after Saint John himself, supposedly due to a slightly morbid resemblance to the severed head of the beheaded saint as it was carried on a platter. Juanes are a common snack in the Peruvian jungle and a key part of the San Juan celebrations. Vast amounts are prepared and eaten during the San Juan festival; whether you prepare them yourself or buy them in advance, you should always take a few juanes to the river. Continue to 3 of 3 below. People leave the riverbanks as the sun begins to set, but the festivities are far from over. The night of San Juan is one big party; people dance and knock back chelas (Peruvian slang for “beers”) until the early hours. There are traditional dances known as pandillas, as well as lively nights in all the nearby discotecas. Fueled by beer and juanes, the revelers somehow manage to dance throughout the night -- quite an accomplishment considering the hours of daytime drinking beforehand. Unsurprisingly, the following day tends to get off to a sluggish start, but June 25 is rarely devoid of activities. Colorful processions and parades snake their way through the streets in the afternoon, marking the end of the San Juan celebrations. The Festival of San Juan is a big event in both the selva alta (high jungle) and selva baja (low jungle) regions of Peru. Popular destinations (from north to south) include Iquitos, Tarapoto, Pucallpa, Tingo Maria and Puerto Maldonado.